The H.O.T. Days @ Georgia Tech camp is a one-week-long summer day camp designed to introduce students attending high schools in Georgia to electrical and computer engineering (ECE) concepts. The goal of the program is to instill an interest in ECE and increase the number of high school graduates majoring in this field. 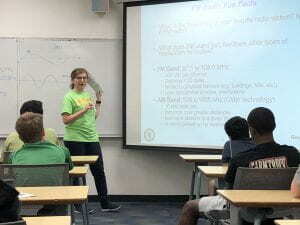 We teamed up with the Electronics Lab at Gatech led by James Steinberg, to teach high school students soldering techniques to build FM auto-scan radios; and learn about electrical engineering principles such as basics of wave propagation, resonance, antennas and electronic circuits.